Over the decades, the first-person shooter genre has grown to become the commercial colossus of the gaming industry, with games like Doom, Half-Life, Goldeneye, and Halo shaping the genre to what it is today. But ever since Call of Duty came in to town, society’s look on what a true FPS is has never been the same. And it’s about time someone took the time to make fun of that. Quickscope Simulator was introduced to me by PewDiePie, who made a video for the game back in late June–if you can even call this thing a game. The pleasure and humor of this game comes from the vanilla algorithm of obnoxious (and quite loud) Call of Duty montage videos featuring people that get so excited they blow out their speakers over every kill they get. KnowYourMeme refers to this as “the 420 MLG montage“. In Snipars: The Game, the only thing you can do is perform quickscopes in an assortment of crudely designed maps which are essentially just a collection of similar pictures that create a vague representation of a three-dimensional environment. My attempts at taking panoramas with my iPhone would look like art compared to these maps. And in these vague representations of three-dimensional environments, images slowly grow larger as they get closer, and as you shoot them they disappear in an explosion of spinning text, logos, Doritos, and Mountain Dew cans, all while some screaming kid can be heard in the background. If you’re lucky, you might get a snippet of a song instead. There are five difficulties, and I will list them from hardest to easiest: “Insane”, “Try Hard”, “Quickscoper”, “Camper”, and “No enemies”. I’m serious, there’s a difficulty with no enemies. Now, there’s no point in trying anything higher than “Camper”, as you will only survive a maximum of 30 seconds, give or take. If you get a certain amount of kills, you will be rewarded with a killstreak aka a “Care Package”, which includes items that have the sole purpose of taking out everybody on the screen, with some exceptions. The game says that after 50, 200, and 420 kills you get a Package, but from my experience with the game it goes comes randomly after you hit 50 and get your first Package. With enough kills, you do level up and once you hit a certain level, you unlock a tweak. These tweaks enable stuff like making every enemy Shrek, replacing the explosions of text and images with all Mountain Dew cans/Doritos, playing left-handed, and my personal favorite: the “gotta go fast” mode. In this mode, every enemy is a poorly-drawn Sonic which goes either to the right or the left while simultaneously getting closer to you in a gradual manner. All while a gleefully distorted version of “Green Hill Zone” plays in the background. Enough funny talk aside, is the game good? If you enjoy Youtubers like Snipars and Vagabonds who have “420 MLG montages” in their DNA, you will probably love this game. If you’re a Call of Duty fan–heck, a fan of the FPS genre in general, you might get a kick out of the sort of parodic madness this game has to offer. Similarly, you might think the game is stupid and immature, and I will understand where you’re coming from if you do believe this. As of me, I think the game serves no better purpose than killing time or having a good laugh at it. I would never actually play this game for hours at a time like I would with a game on my Xbox. 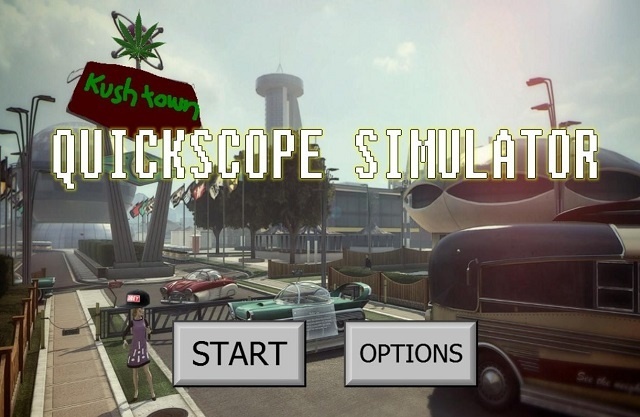 Besides the extra modes that will keep you entertained for a maximum of 5 minutes, there’s not much that Quickscope Simulator provides besides–well, quickscoping. And loud funny noises. And logos. And explosions of text. You can download the Call of Duty Snoop Dogg DLC here in its latest version. Check it out, leave a comment if you like the game, and until next time, folks…stay classy, and perfect those quickscopes.